After playing “Horizon Zero Dawn” back in March, I figured that I had my personal GOTY slot locked down. Then, I finally got around to playing Nier: Automata, and now it’s a little less certain. I’ve never played a Yoko Taro game before, but I understand that he claims to make “weird games for weird people”, and Nier definitely hits the mark there. It’s half super-gritty post-apocalyptic endless war ANGST DARKNESS EVERYONE DIES game and half surreal goofiness (moose wrangling! ), with a fair bit of third-wall shattering and bleak-but-gorgeous visuals thrown in. His previous games have a bit of a reputation for having great stories but coming up short in the gameplay department. This one is a fortunate exception; it’s by Platinum Games and that’s a name that is pretty synonymous with super fast and flashy movement and combat systems. Running around the ruins of human civilization and beating stuff up is an absolute joy, and I occasionally had to remind myself to get back to the, you know, plot. It has five endings that you need to see to actually finish the storyline, and 21 joke endings that you can trigger by disobeying what the game tells you to do – for example, if your allies are making a huge heroic sacrifice to hold off enemies so you can get a door open, and you opt to fight alongside them instead of opening the door, it will eventually tell you that your attempts ended with everyone dying and roll end credits. Another comes when an NPC asks you to eat a fish because she’s curious what effect it will have on you. Spoiler: It’s not a good effect. It’s pretty rare for a game to give you more than the illusion of choice, and I was quite tickled whenever I ran into one of these endings by accident. But, back to the story endings – like I said, there are five, and this is normally a massive turn-off for me because games with multiple endings often make you play through the exact same events from the exact same viewpoints, satisfying arbitrary conditions along the way, just to see all the different ways the story can diverge in its last ten minutes. Nier isn’t like that. The first play-through, which took me about 13 hours, tells one story. The second took me about six, and was split between experiencing events from the first through a different character’s perspective and seeing entirely new events. Endings 3, 4, and 5, which come after the parallel stories of the first two routes, took me another ten hours or so. It turns out that rushing the second story was a bad plan, because my character was woefully under level when starting the third story and I had quite a time just getting up to the point where I didn’t feel like I was made of tissue paper. 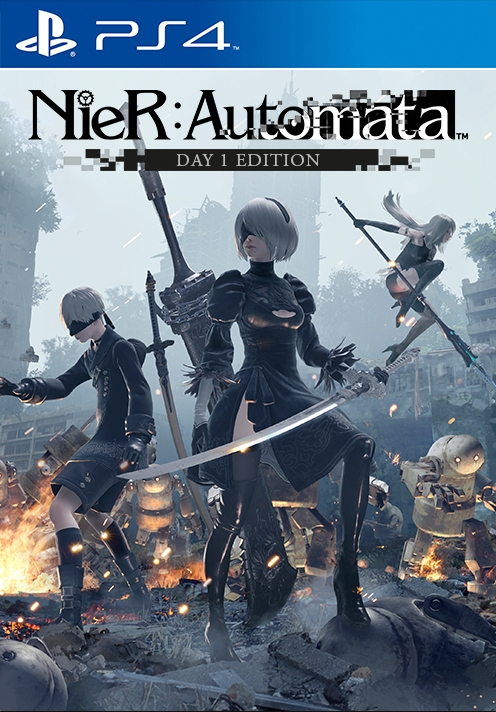 Anyway, if you like really pretty games with stylish action and swords and that occasionally switch into bullet-hell style shooters or abstract maze games with chiptune soundtracks, or if the thought of riding a moose or debating philosophy with a robot appeals to you, Nier will give you those things. Set aside about 30 hours to see it all, though. Reading so much about this game has really intrigued – well actually, this AND the other one you mentioned, being Horizon Zero Dawn. I was never too big into the “your decisions make a huge impact on the world” because I cannot fathom how a development could _truly_ make that happen. Occurrences like you described (the game ending almost immediately and the credits rolling) sounds really funny though, and that’s how I think some games should go, rather than “do anything you want!” when it reality it means that one of five pre-programmed things can happen. Once we reach a state of artificial intelligence where things in the game can be _truly_ left up to the players individual actions, that’ll be quite impressive to see! For example, in a game like Skyrim, I want to be able to kill some random guy, only to be hunted down dozens of gameplay hours later by his father seeking vengeance. Maybe he sets up an elaborate scheme where he pays someone off to have me go on a quest where I am trapped and have no way out, and then a hoard of bears is unleashed to kill me. Then if I manage to escape, I can go kill the quest giver and steal back the $500 or whatever the father paid them off with. Now THAT would be some serious ability of choice! Horizon plays things pretty safe, I think any plot-essential character is immortal and there’s no way to get into a no-win state. That’s not a bad thing, necessarily, it would be awful to be 20 or 30 hours into a game and discover that you’re stuck.